However now I (think) I understand how this works, I'm going to chronicle my adventures in a single thread per area. This one for the 2016 GAAR another for the NZAR 2016 etc. Anyway, go read the first part if you haven't already and I'll get on with the next part of the journey. 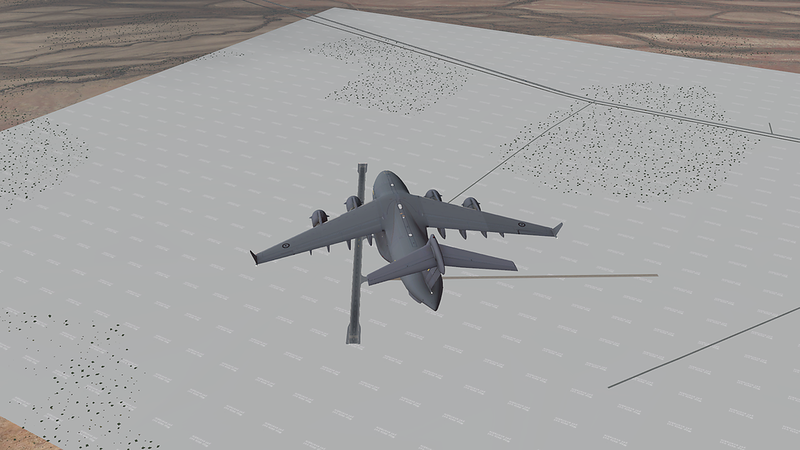 Due to the sheer size and speed of the C-17, as I said in the last post, I'm not doing each leg one at a time but instead I'm joining 2 legs together to get something more interesting for Big Bird. And since all of these are meant to be learning runs, this time I thought I might program the FMC. 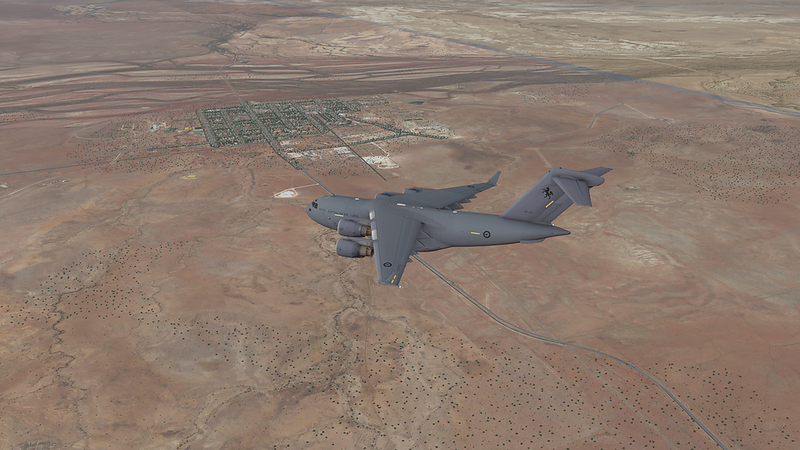 Unfortunately the C-17 Globemaster III from Virtavia was made for X-Plane 10.10 and so I've had to take her into Plane Maker to update a couple of things. 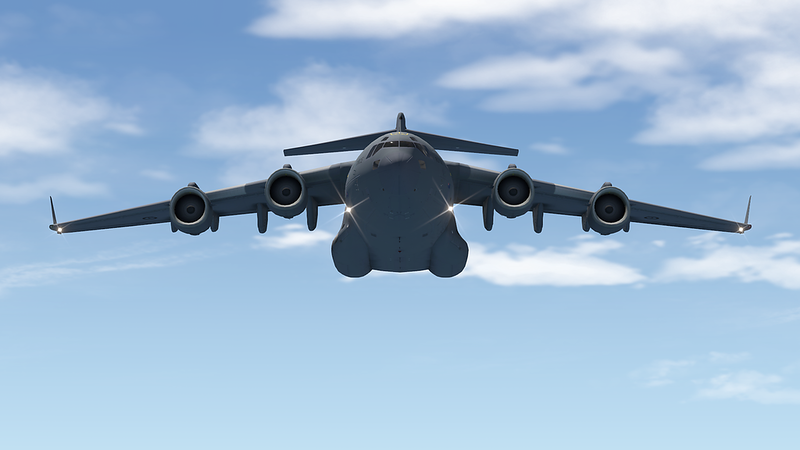 First I found those annoying flying pieces of geometry (engine struts) and I was able to mark them as invisible, but in addition to that XP11 does not support the old FMC and so I had to take that out and install the new one. 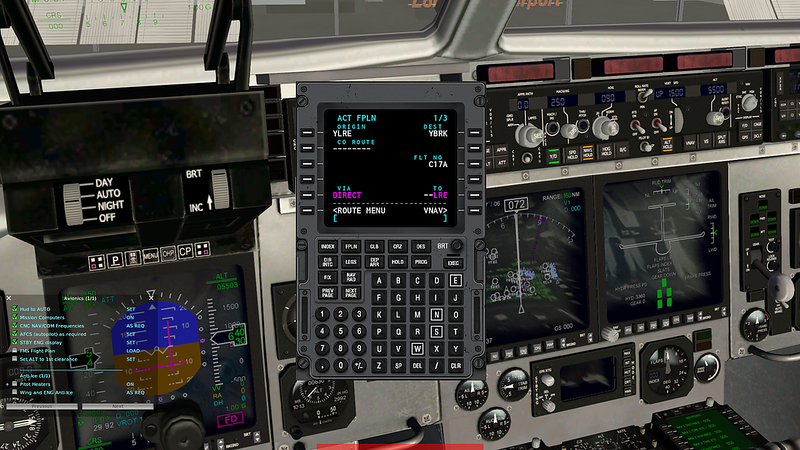 Because of this, the FMC does not work from the centre console and has to be handled from the pop-up. I've emailed Dawson Designs and hopefully they'll update her correctly. 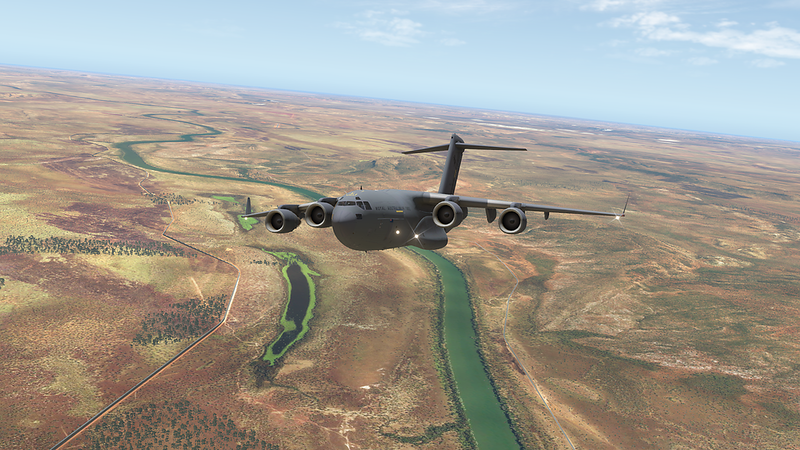 As with all of my adventures, where possible I use Ortho4XP for the mesh and ortho photos. 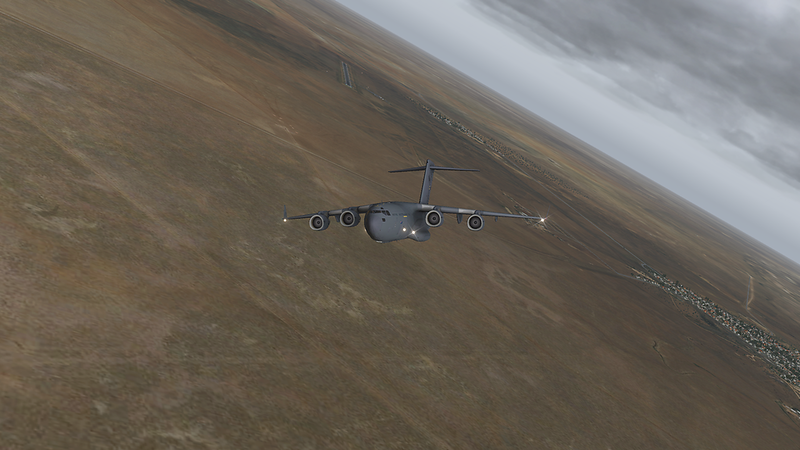 After mapping a key to pop out the FMC I entered our route. ..which didn't quite go to plan. It'll buff out I'm sure! Once we were up and going in the air, it was fine and a quick visual inspection showed no lasting damage. When going through and doing these reports I really strugle to pick out just the right shots to include, but this one I just can't resist. 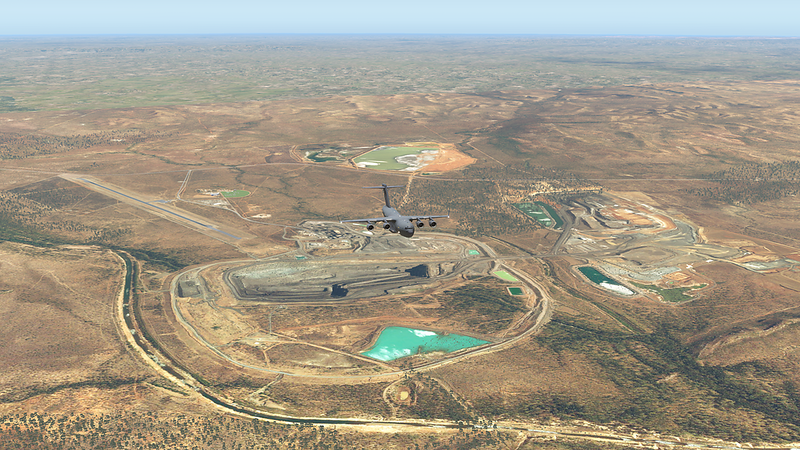 Coming up on McArthur River Mine. 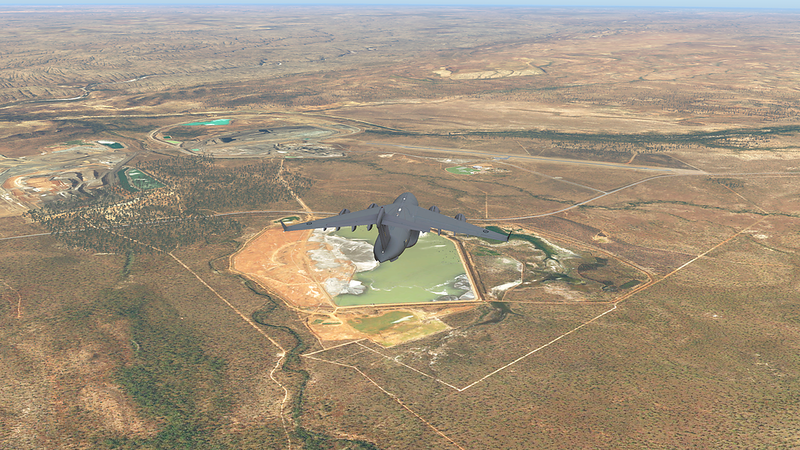 The McArthur River mine is one of the world's largest zinc, lead and silver mines, situated about 70 kilometres southwest of Borroloola, near the Gulf of Carpentaria in the northeastern Northern Territory, Australia. 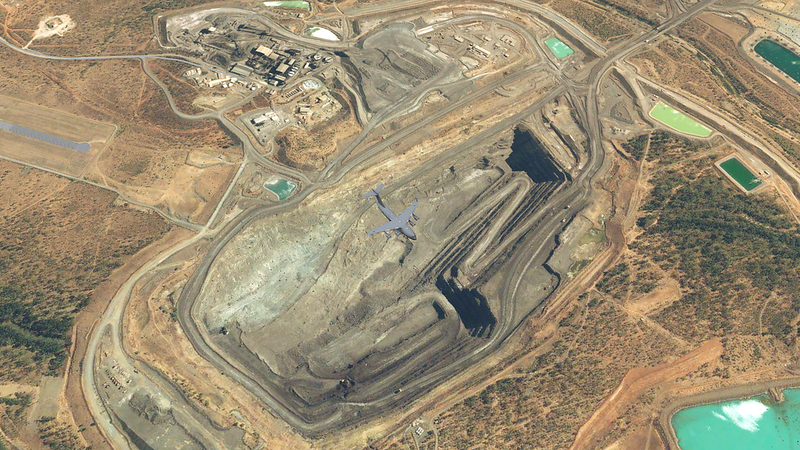 It is operated by McArthur River Mining (MRM), a subsidiary of the Swiss mining company Xstrata. Although discovered in the 1950s, when it was originally called the HYC or "Here's Your Chance" deposit, it only opened as a mine in 1995. Initially an underground mining operation, the mine has been converted to open-cut. Leaving the mine behind us we continue on our 094 track towards Mornington Island. Hopefully the Sarge called ahead and orgaised our accommodation with the council! Sing it with me now! "I like big butts..."
Certainly feeling more confident with this Autopilot thing. A BIT more complicated than what I had in the LET L-410 for the MEBAR. 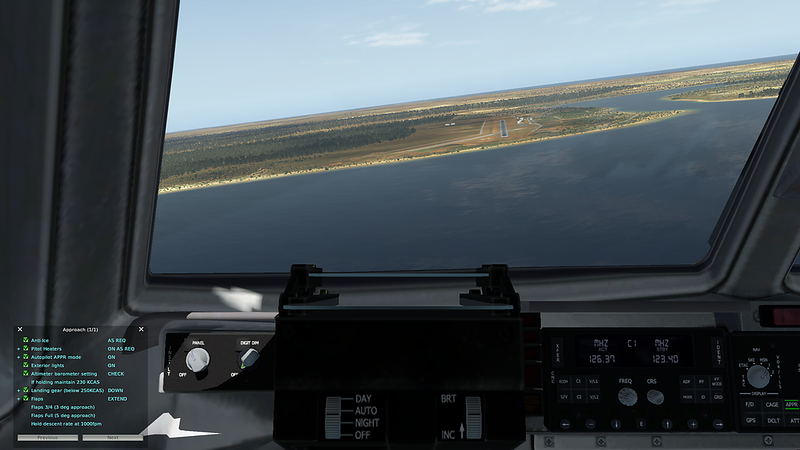 Thankfully this time I had NO trouble finding the runway on descent and now into final. 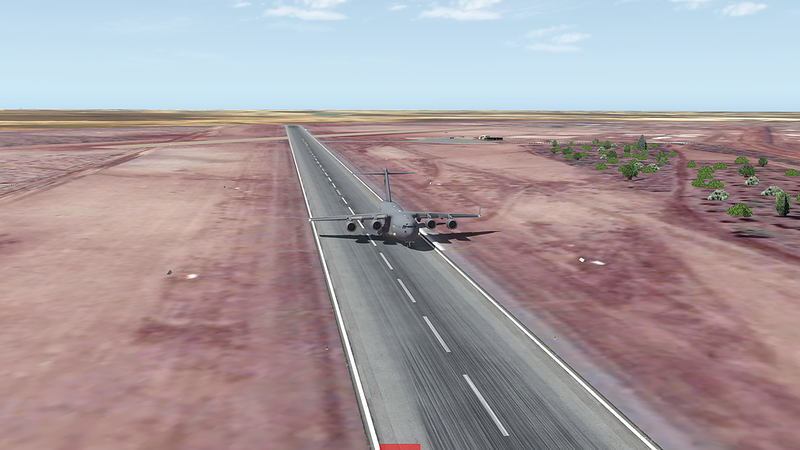 Yea OK So I was a LITTLE hot coming in so I didn't quite stop on the tarmac. Coulda been worse! Parked and ready to head down the beach for a bit of fishing with the locals whilst avoiding the local crocs! Whilst I did live in Normanton for several years (Destination of our next leg) I never made it over to Mornington Island, but had a few mates from there who couldn't stop bragging about this fishing. So what did we learn? 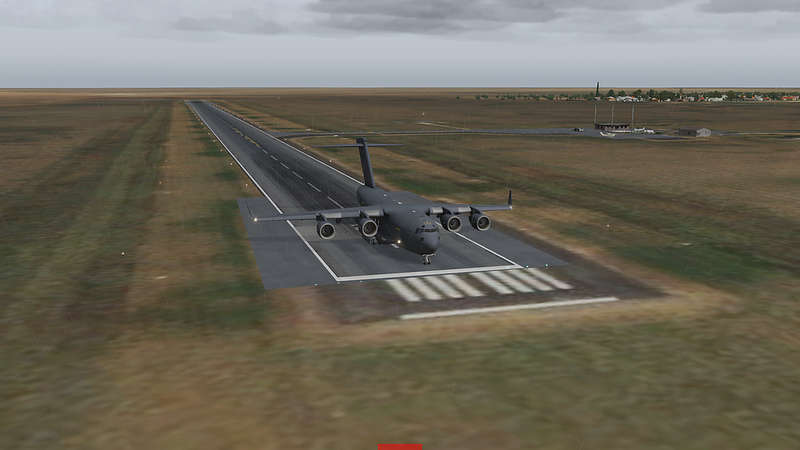 I had waaay to much load on for takeoff and I still need to work on both takeoff and approach. 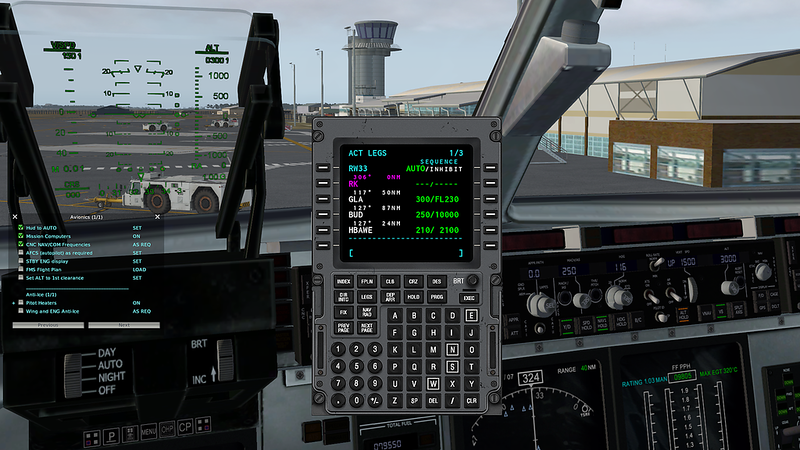 But I also learned how to program a basic flight plan into the FMC and then activate the autopilot to use that plan to fly 300Nm, so not a complete disaster. We've got a bit to go before we hit Harvey Bay and the next leg I think will be a single leg as I need to stop and visit the folks in Normanton (They've just moved back last year). Thanks for reading and see you for the next leg. 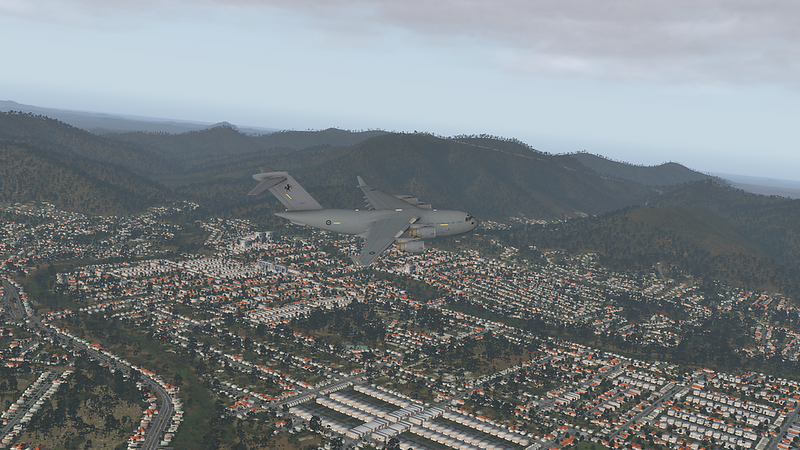 Nice shots, a couple good laughs (Yes, I too have trimmed the trees once in a while on takeoff in various aircraft :D). 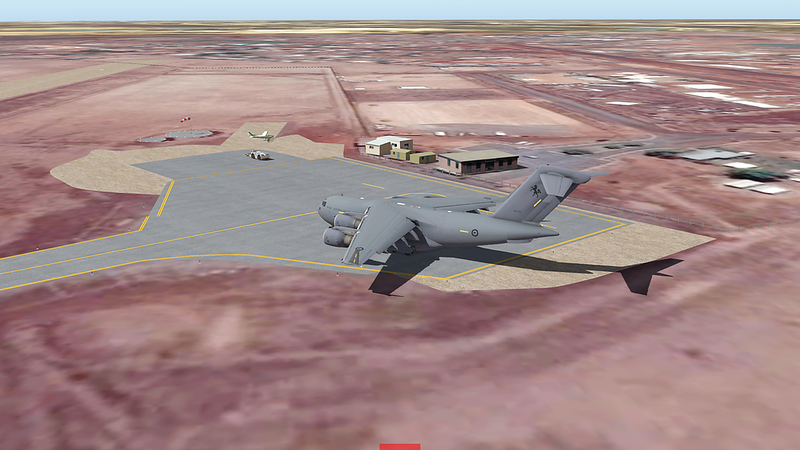 Your C-17 looks like a bull in a china shop at the airfields thus far. 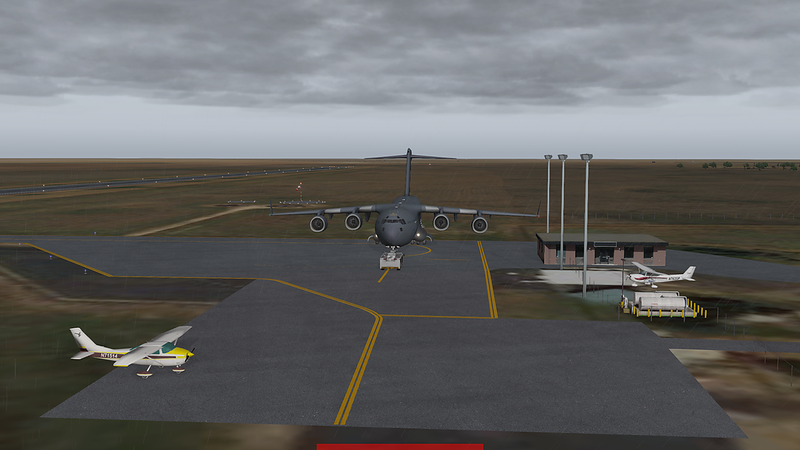 And... might have needed to hit the thrust reverse just at tad quicker? I bet that bird is capable of sticking that last landing without running off the mat. 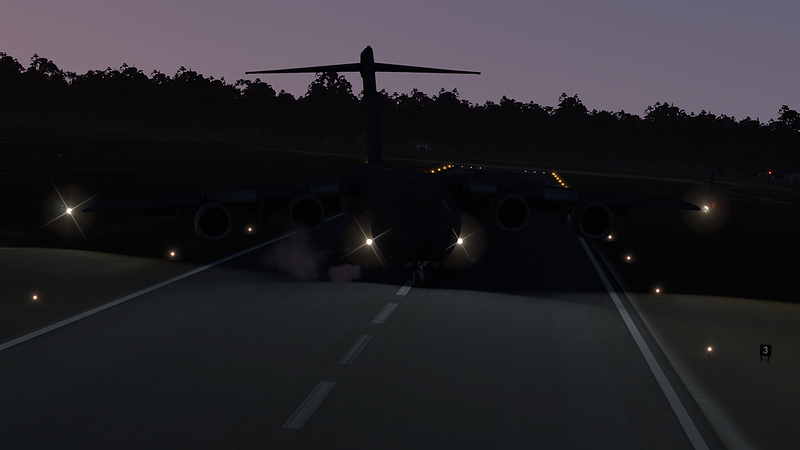 There was a story recently of a c-17 landing by mistake at a small regional airfield in the states here sometime ago...oops...but they stuck it, and then took off again. 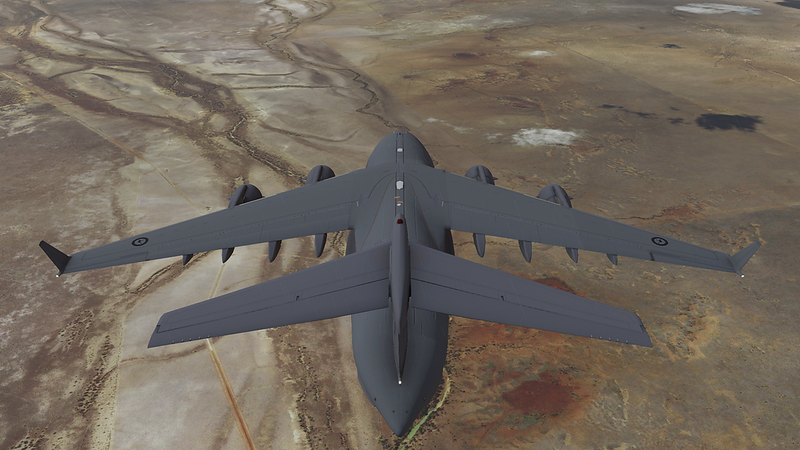 Amazing planes. 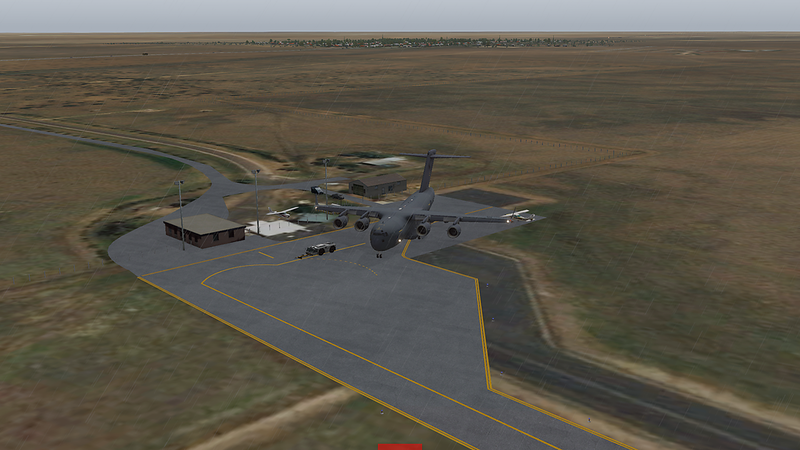 Nice PIREP and good shots, I hope those poor aircraft at Ngukurr were tied down. 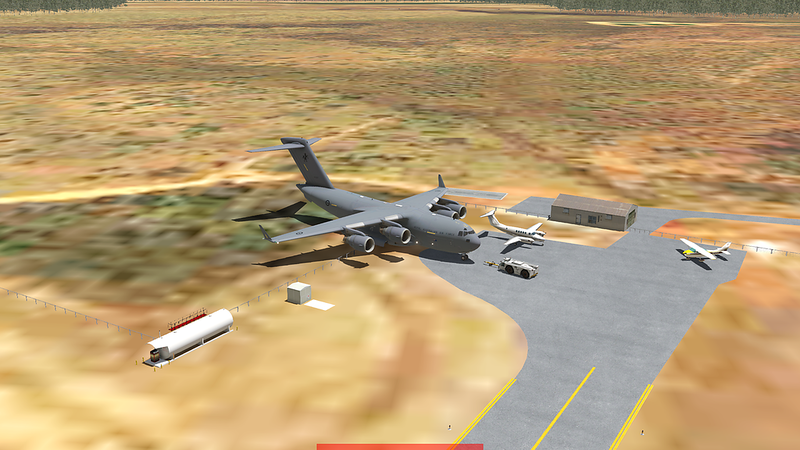 Knowing that the C-17 is MORE than capable of taking off and landing on short runways I went back to YNGU to set the record straight. 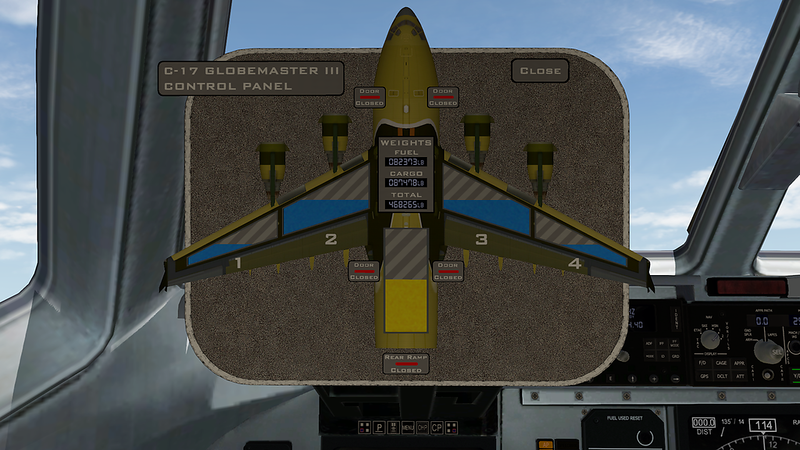 After checking the weights and balances it seems that be default it loads with a full cargo load. 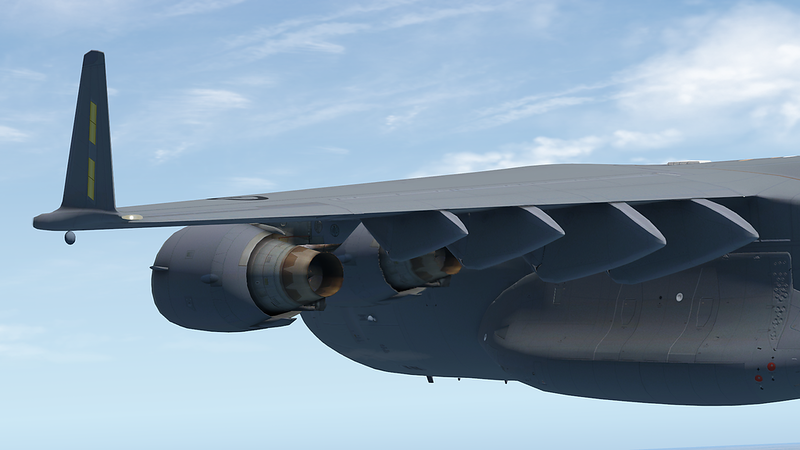 Dropping all of the cargo we go a MUCH better result (unsurprisingly). And we climbed out beautifully too. 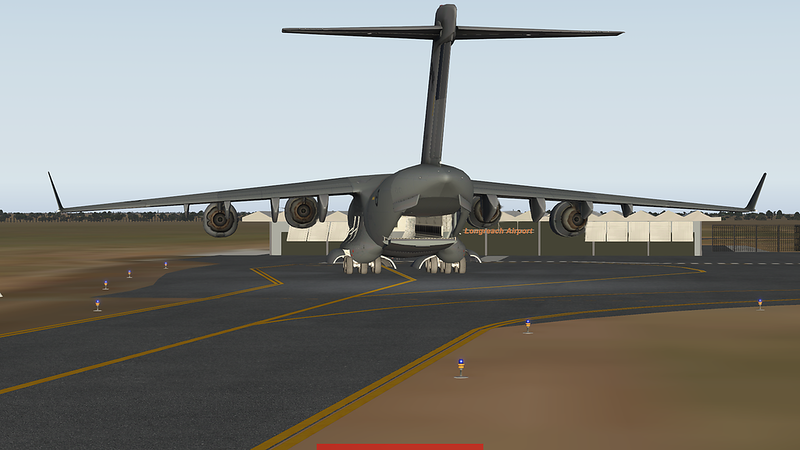 OK Lets try with a half load of cargo at 87,478Lbs. 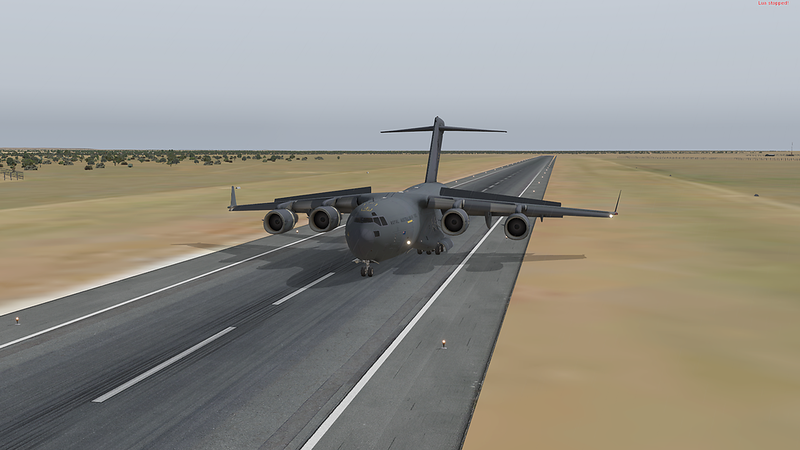 A nice Vr of 128Kn and we take of 3/4 down the runway. You beauty! Thinking I understood this more now and it was probably more technique than weight I went back to a full payload. Departure from Mornington was scheduled for 1500 local time, so we had time for a swim and a fish before we left. Winds were mild at 14Kns from 045 but pretty much nothing short of a Cyclone is going to worry Big Bird. 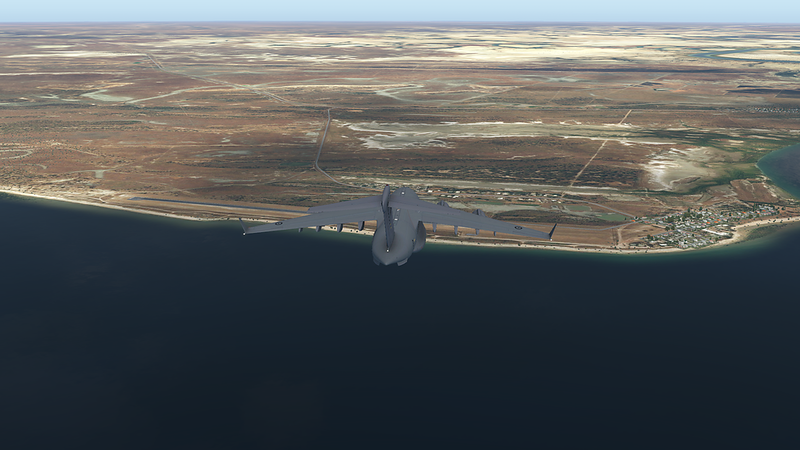 The actual GAAR calls for a touch and go @ Karumba, but seriously, unless you like to drink and fish (OK So that's a lot of people but not me), there's no other reason to go there so I'm just going to Fly-By. 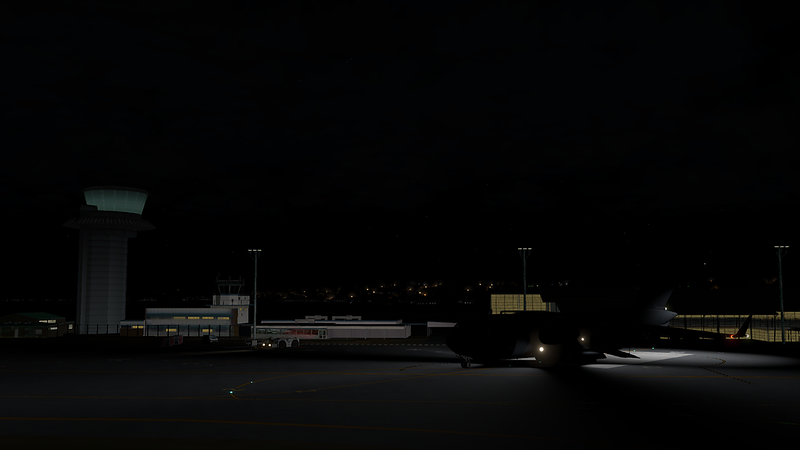 Good thing that we're NOT coming back here again as I think I might have damaged some of those cars parked behind me as I "gibbit some" to the engines to start her rolling down the apron. 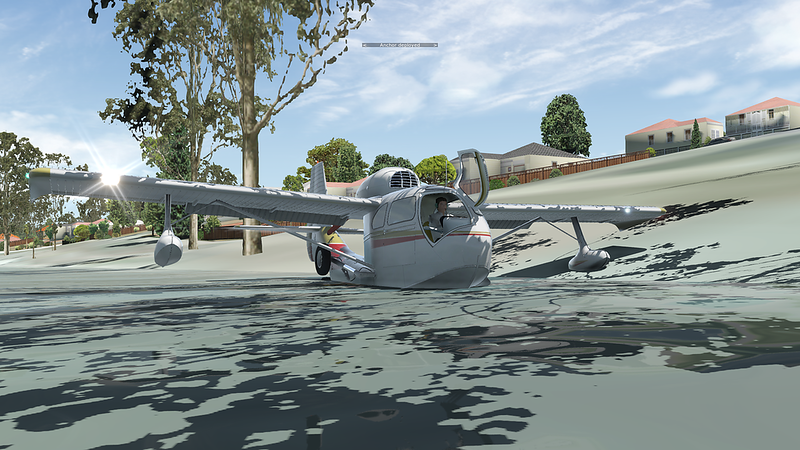 Maybe I should have used the tow-tug... NAH! And we're leaving. 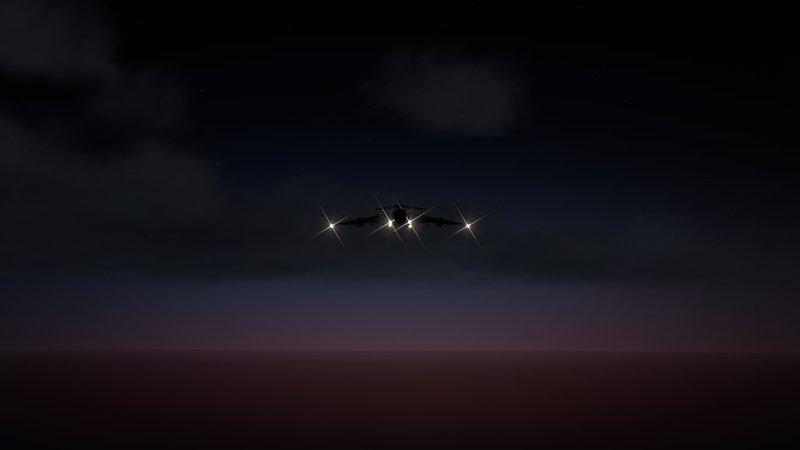 On a Jet plane, pretty sure I wont be back again... Just remember folks I'm using photoscenery WYSIWYG (what you see is what you get). Shots like this though make it all worth while! 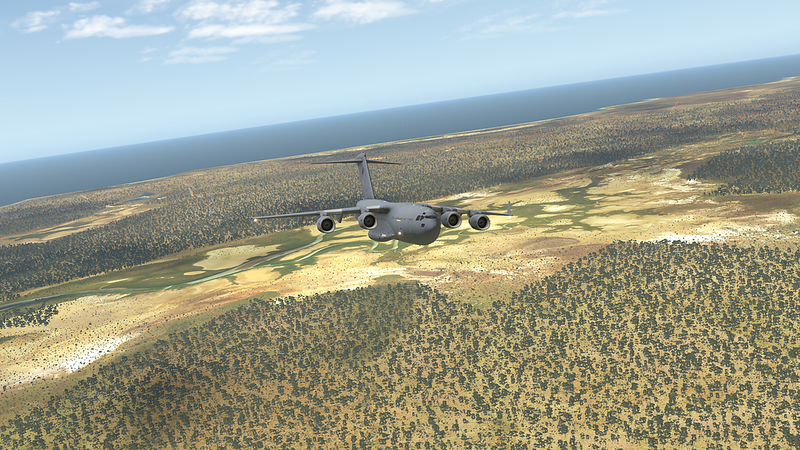 Ortho4XP FTW! The Norman River used to see many cargo boats sail down to Normanton, which was the main freight hub for the area at the time down to the mines in Mt Isa. Later on Karumba township was built as it became too difficult for the boats to get down the river to Normanton. 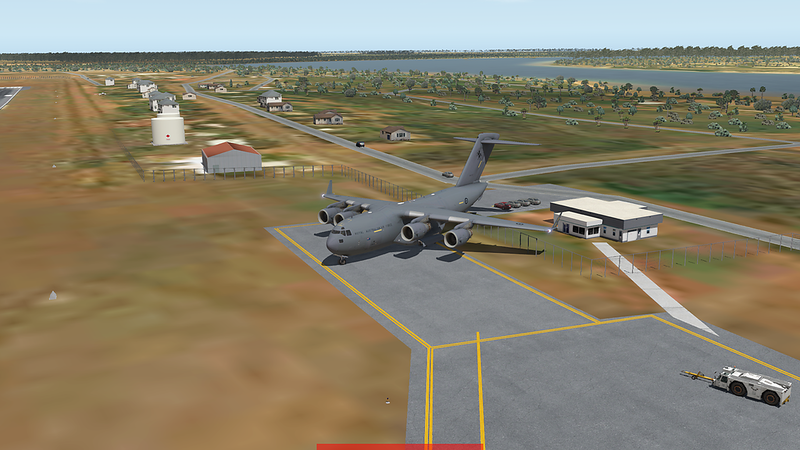 Karumba Airstrip is a little way from the town proper, but it looks like the "Beach" has exploded with houses a little since I was there last. I just love the way she looks as she banks into a turn. 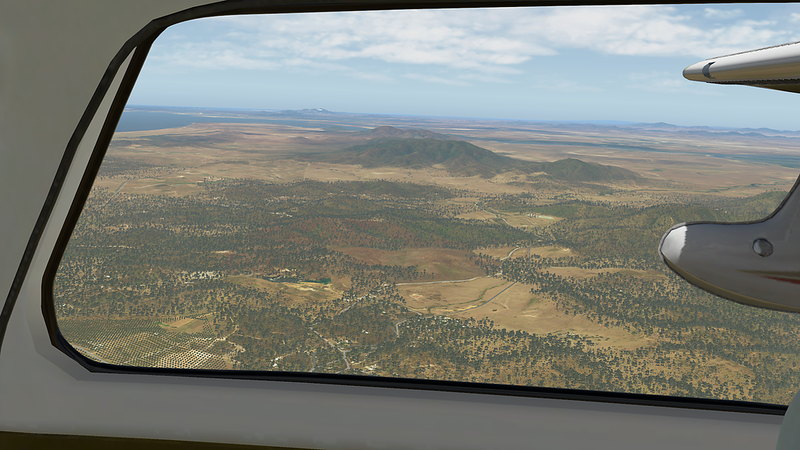 Karumba township in the background. 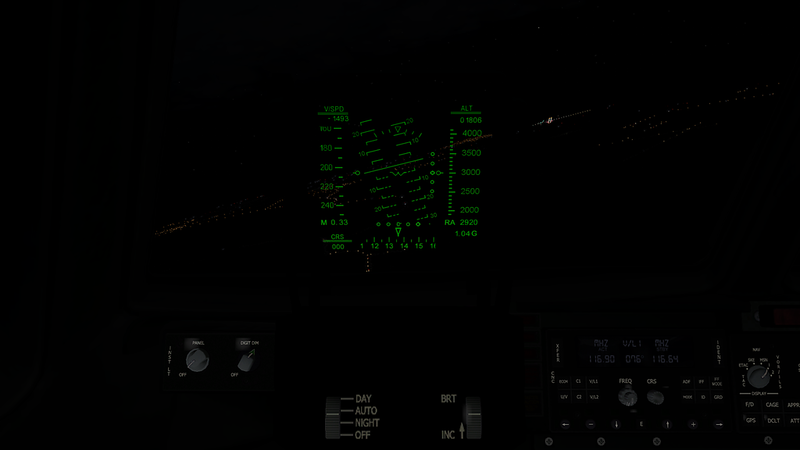 From here we're turning to intercept our approach NTNNE into YNTN. 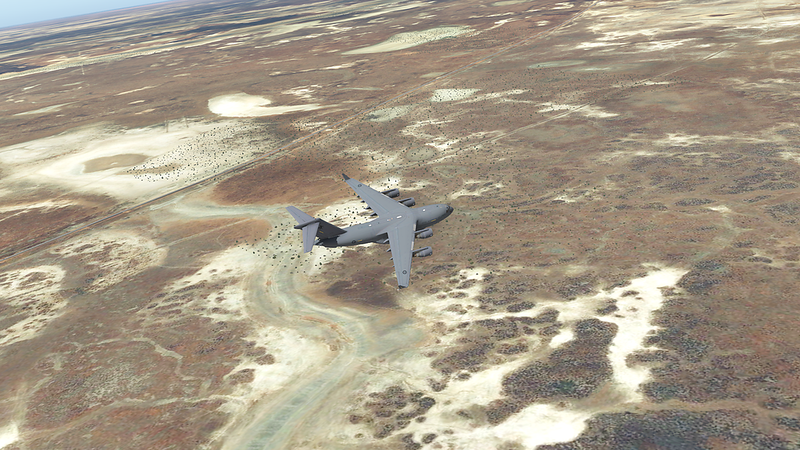 Most of the area between Normanton and Karumba (IIRC) is pretty baren salt plains. Though you do get the occasional bush pig. I really wasn't happy with the Google images so I did (later, for the next leg) go back and regenerate them. I can really take a lot of time to get a decent set of photoscenery, but that time is well spent! 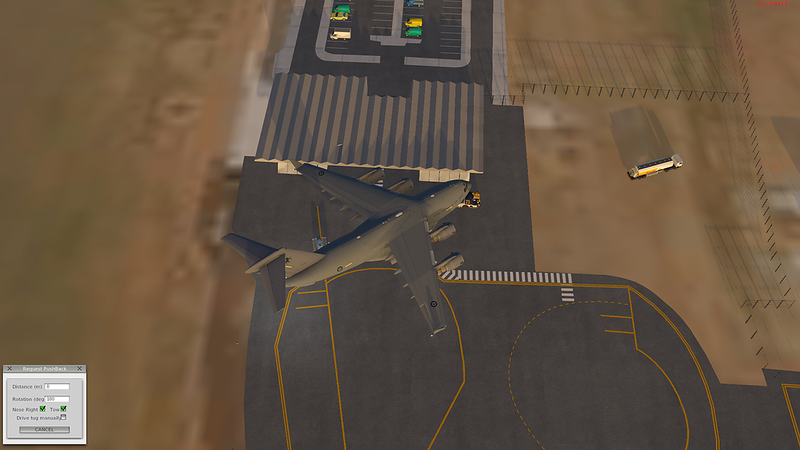 For some reason the overlay wasn't working for the landing. 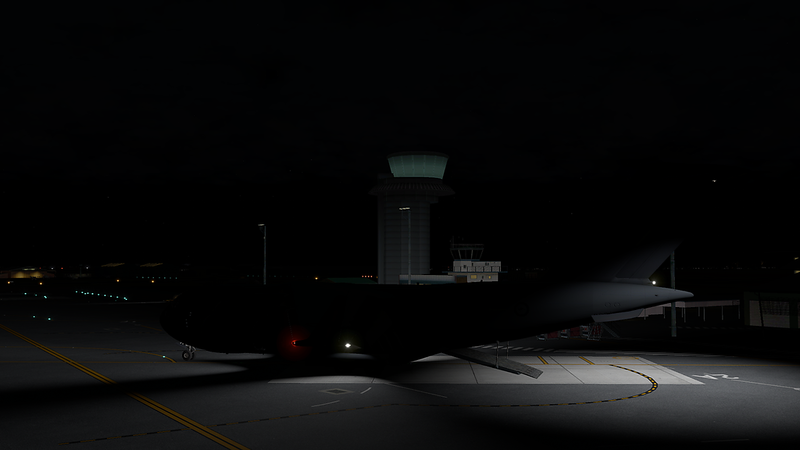 But here we are at YNTN, parked, cold and dark. 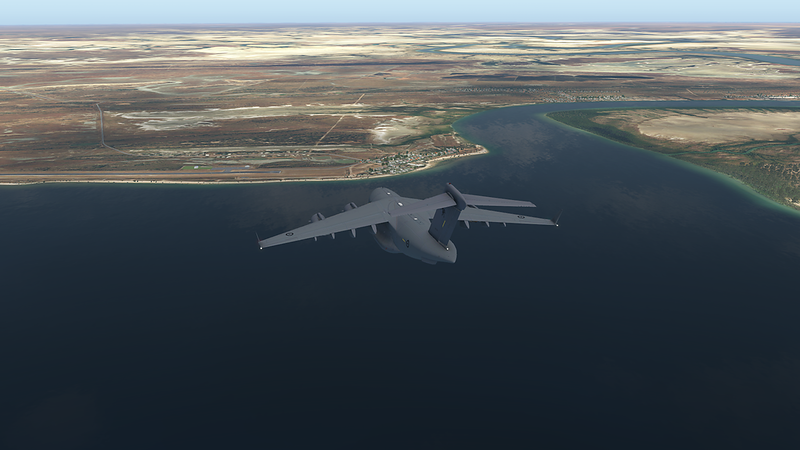 I did pick this little fella as I thought to maybe do some screenshots as I flew around Normanton, you know, point out the 16 pubs ( well there's only 4 now ) but considering there are more Humpback Whales living in the Pacific than there are humans living in Normanton... there's really not much to see... And to quote the great Luke Skywalker (Jedi Knight) from Return of the Jedi: "I used to live here you know..."
What worries me is Han's reply. A couple days in Normanton is MORE than enough to cure ANYONE of home sickness and you will WANT to leave (unless you REALLY like the fishing, like my Dad). 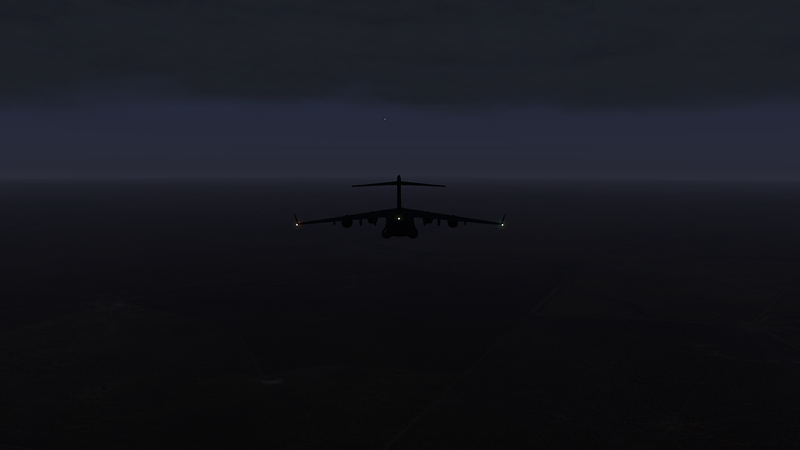 So we're are fueled and ready to go at 0800 local and HOLY COW IT'S RAINING! Seriously, in "Tropical North Qld", summer time is commonly known as the Rainy Season, or Crazy Time as everyone just gets hotter and hotter and hotter until it bursts. It's not uncommon in the middle of Summer (and for the GAAR this leg was supposedly run on Feb 16) to be hitting 49C (120.2F) and 90% HUMIDITY! It's. Is. NUTS. And you go nuts just waiting for the rain. Seriously though. Why do people INSIST on parking BEHIND me?? The eternal question... (BTW I did say I went back and fixed up the scenery and overlay as you can see here). It's hard to see but it was raining, honest. Look just keep reading and you'll see rain I'm sure of it. 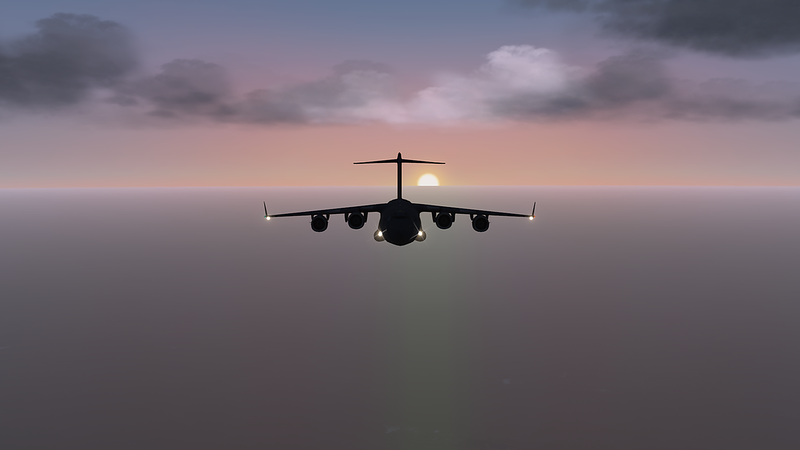 Gosh I wish Virtavia (Dawson Designs) would update her to XP11 standards with PBR textures as this image would look just about perfect. And no that's not because I'm leaving Normanton behind in my wake. Unfortunately you can't really see it here but the windscreen wipers were doing the jitterbug on the exterior shots. 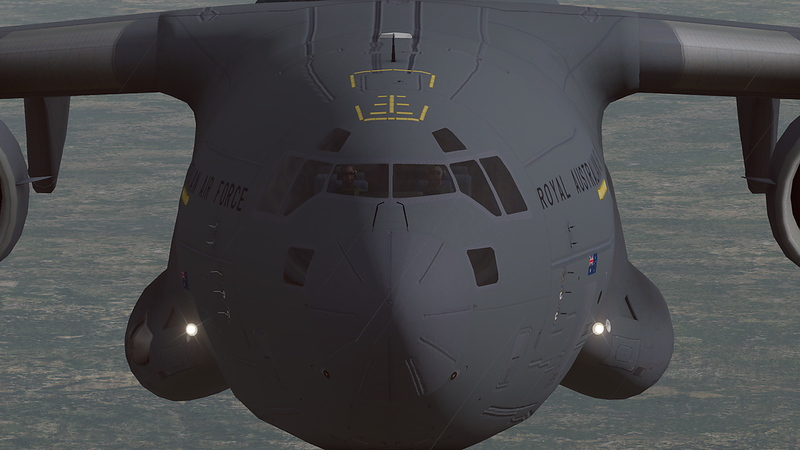 Inside it looked fine, so it's just the exterior animations. You can see from the shot that they are definitely not where they should be though. 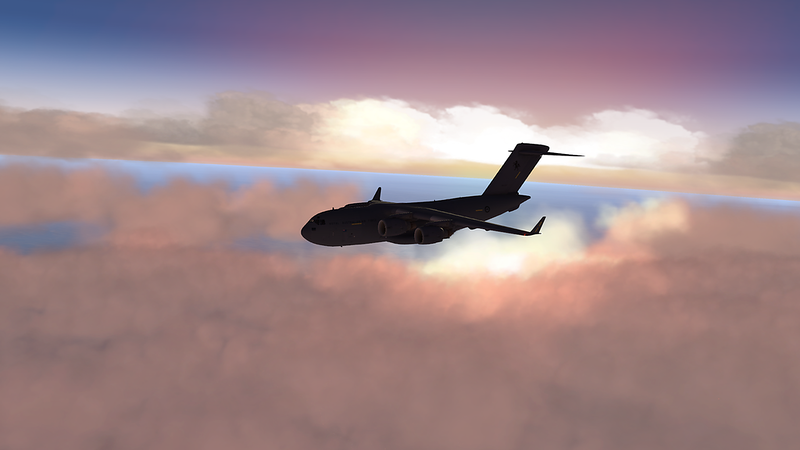 For default clouds, these aren't so bad. I am looking forward to SkyMaxx Pro when I get it though. 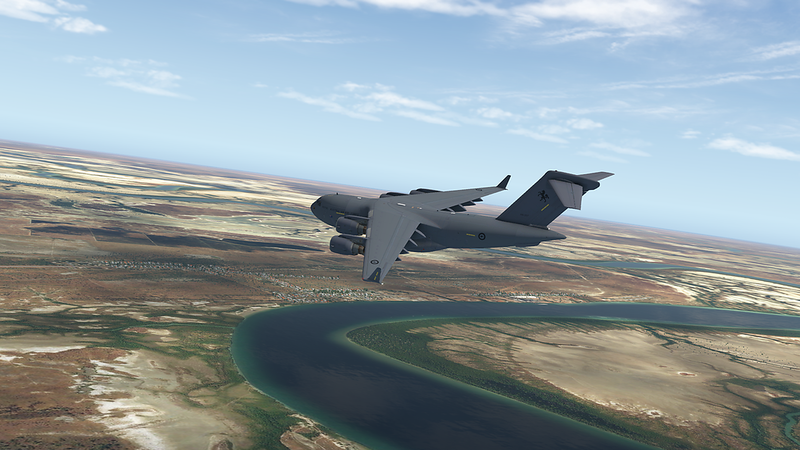 I'm hereby renaming Ortho4XP, screenshot maker! Just... wow. She may not be the PNW with all those mountains and lakes and wotnot, but she has her own charms, this Great Southern Lady. 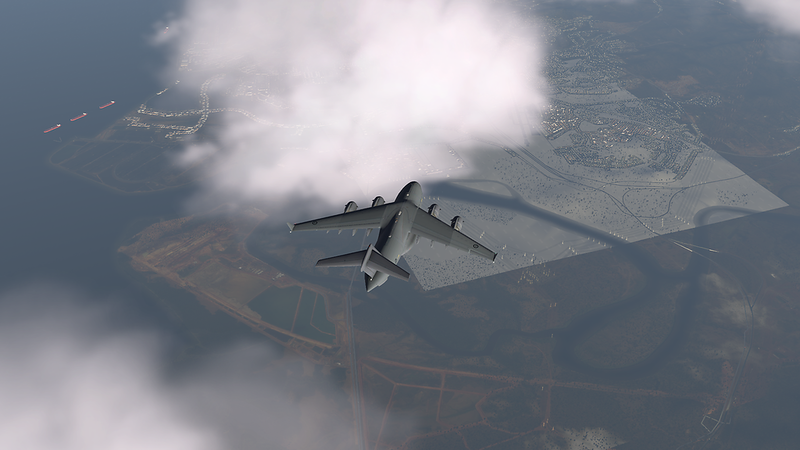 Sometimes though the overlay/scenery doesn't match the ortho. But HEY! 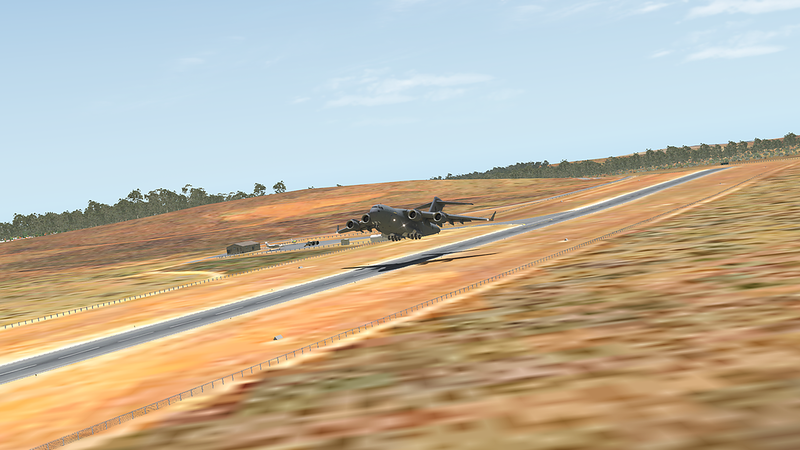 I stopped at the end of the runway. 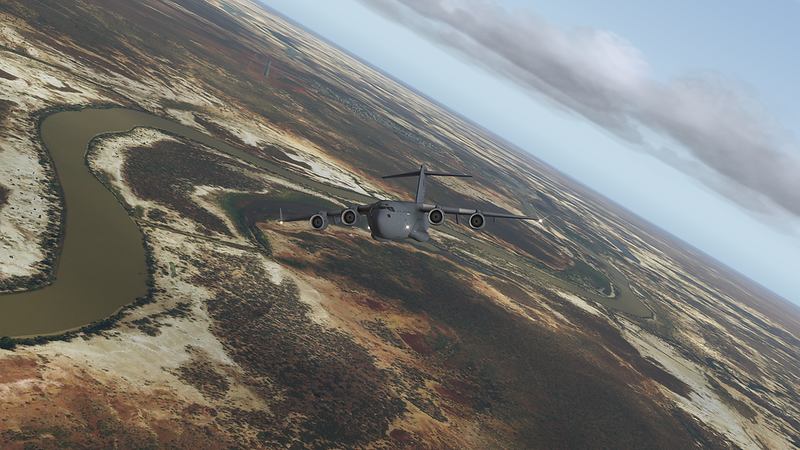 There's no fuel here boys so we're not staying long, so stay within reach.... Next stop, the birth place of QANTAS, Longreach. Surprisingly the rain stuck around overnight and our 0730 start from Julia Creek see 12Kn winds from 065 and we are headed to Longreach via Winton. 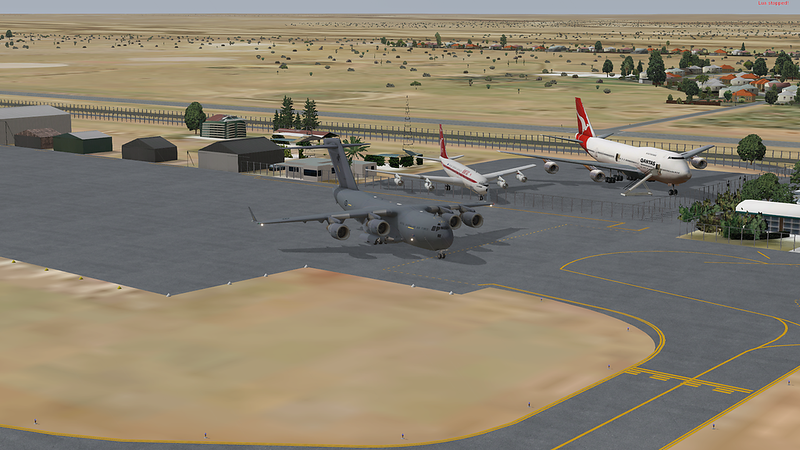 Once again, the GAAR calls for a stop at Winton, but it's only marginally bigger than Normanton so I think we'll fly overhead and wave and keep on trucking to Longreach. 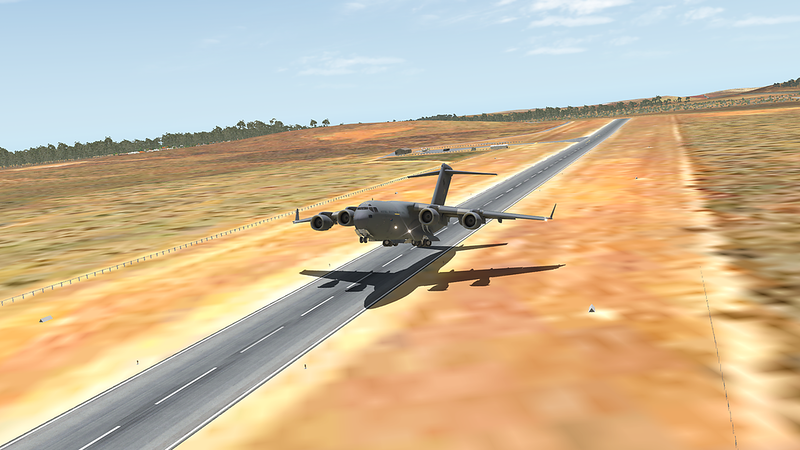 This time I decided I would use the tow and after a couple of restart whilst I figured out how to use the darn thing we rolled out onto the runway.. They didn't actually have a tug on standby so it's a good thing I brought mine with me. Oh and no-one parked behind me.... I think maybe the word is getting around. 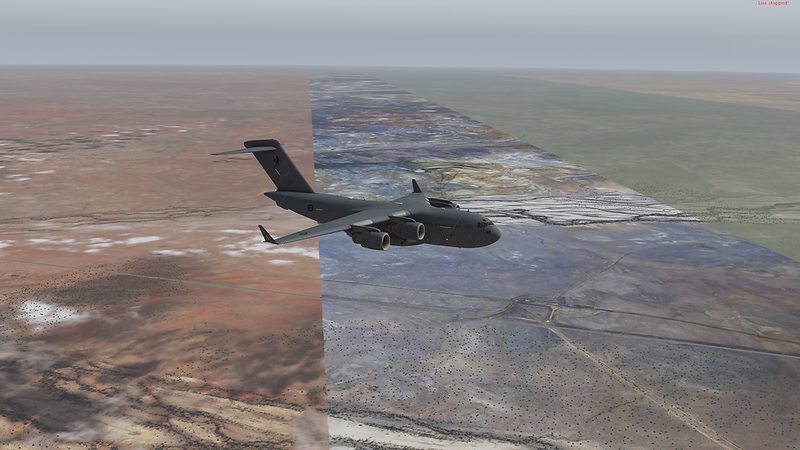 So we leave the misaligned Julia Creek behind us. 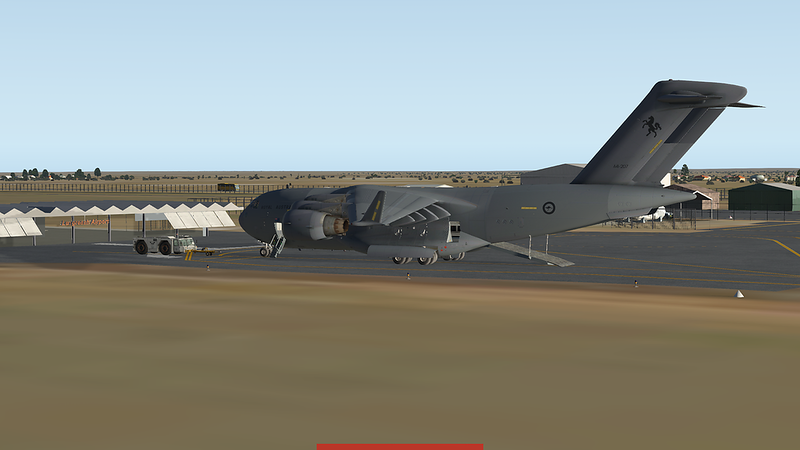 Hmm maybe I should have stopped in Winton after all. I hear there's a great Outback Festival there. Nope, not stopping here. Can't. 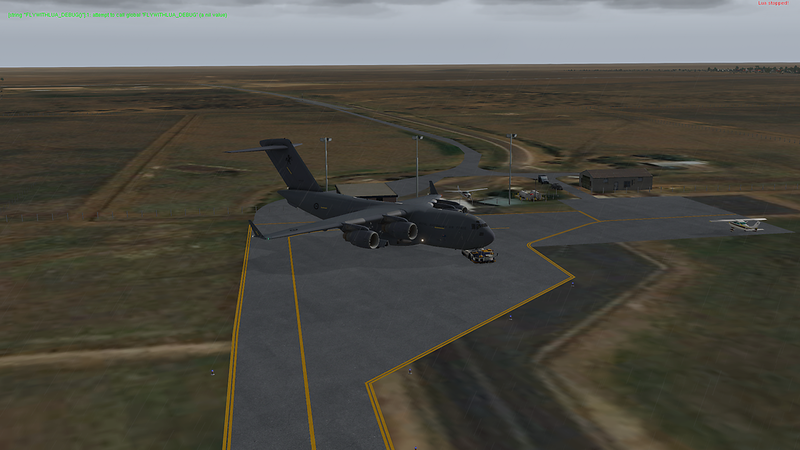 No ortho zoom18 for Winton YWTN. Yup, nothing to see here, just ya typical four seasons in one day thing... Wait, that's Melbourne! 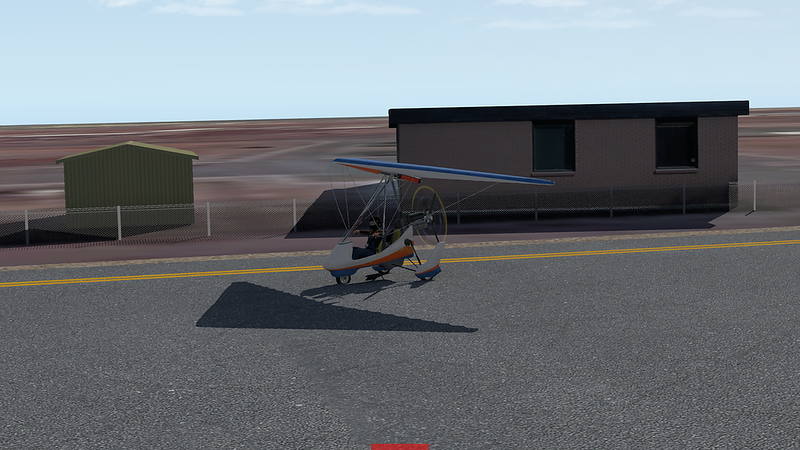 This kind of thing can be a real problem for Ortho fans though if you like to fly in out of the way places. There were so many times I had to redo tiles from a different provider before I found one without any horrendous mashups like this. For the MEBAR I settled on the ARC servers as Google and Bing were woeful. For the most part on this trip though I've been using Bing and Google as they've (mostly) been great. 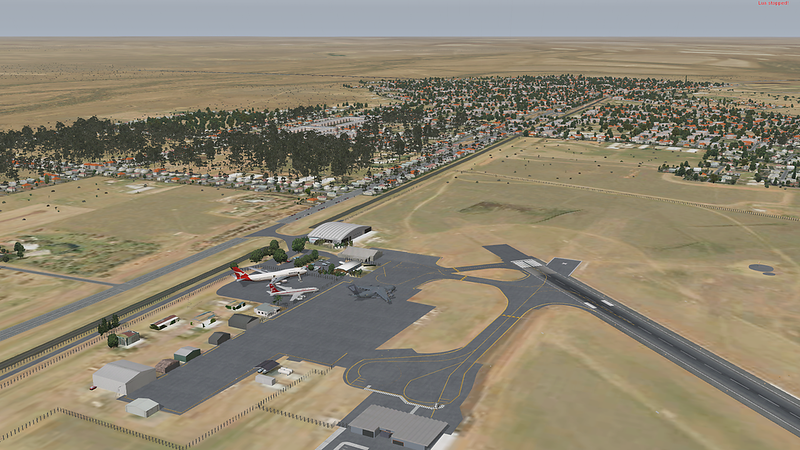 Touchdown in Longreach. This time I remembered my spoilers! 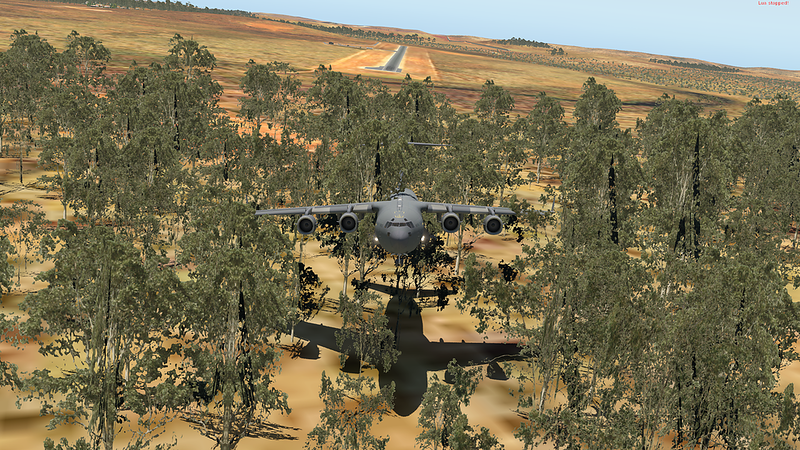 Though I REALLY need to read up more on descent planning. 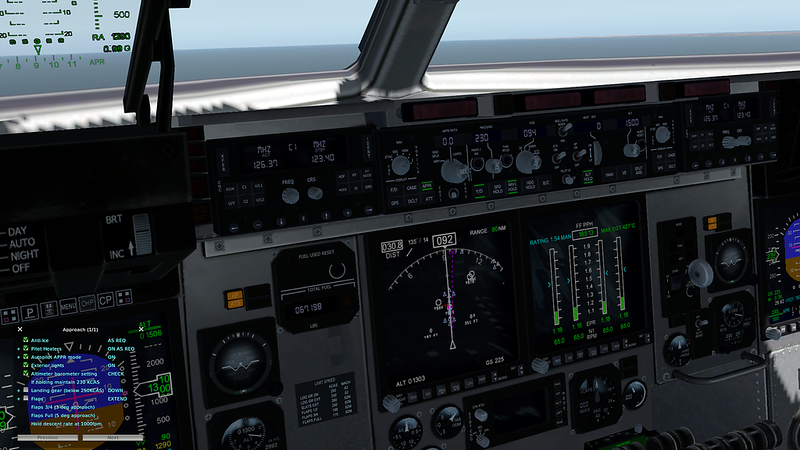 Gods help me I'm only descending from FL055. 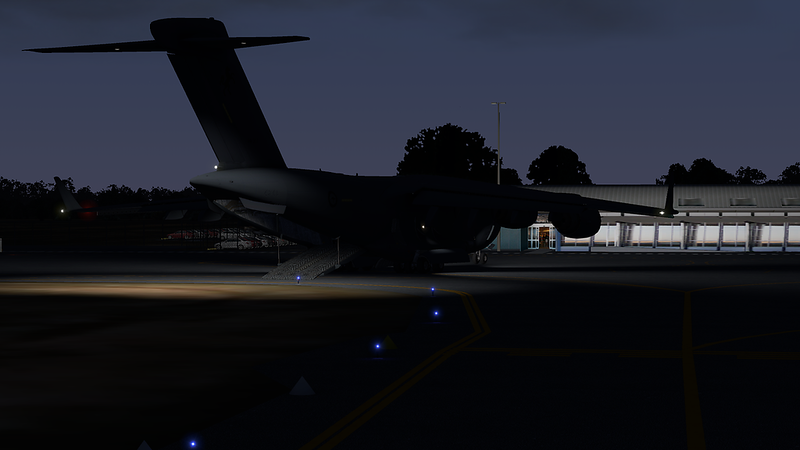 Parked and Dark next to the QANTAS museum. Phew, I might actually head into town as it seems large enough to MAYBE have a Coffee house somewhere. Wish me luck! Terrific shots and the new legs. 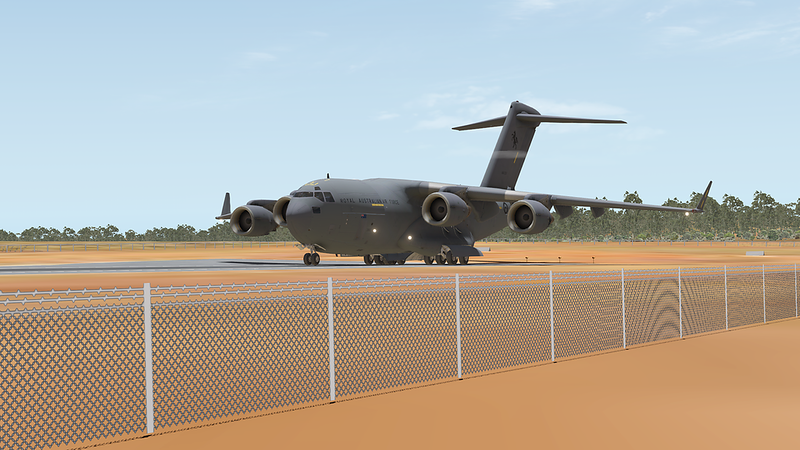 Love that you finally got it on a ramp better sized for that beast. Great shots on all the legs Beejay, looks like you are having lot's of fun. Funny you should say that @wain as I was thinking about doing a mini tutorial on it and I think you just convinced me. Since I was combining two legs I thought I'd set this up as per the Leg 09 directions so we are still departing on 22nd Feb but at 1800 instead of 1130 for Leg 08. 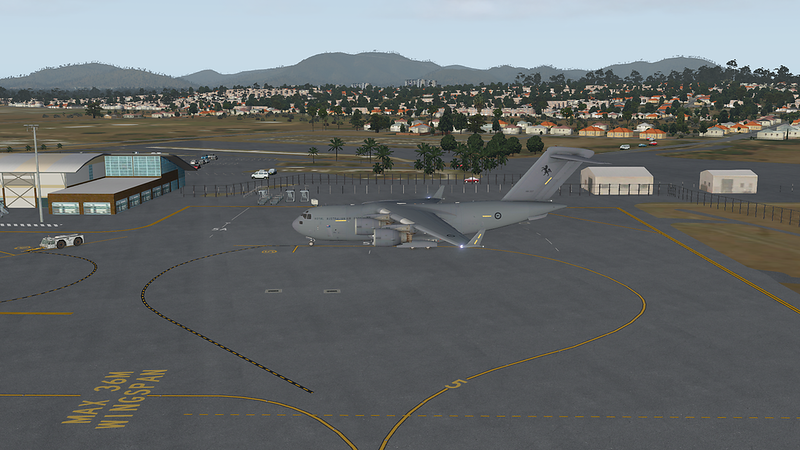 Due to technical failures of a certain tug (pics below), I actually had to restart this flight twice. The first time I set the weather as per the GAAR, the second time I just used the real-life(tm) weather. I did eventually manage to find the coffee I went in search of and was well prepared for our evening flight to Rockhampton. 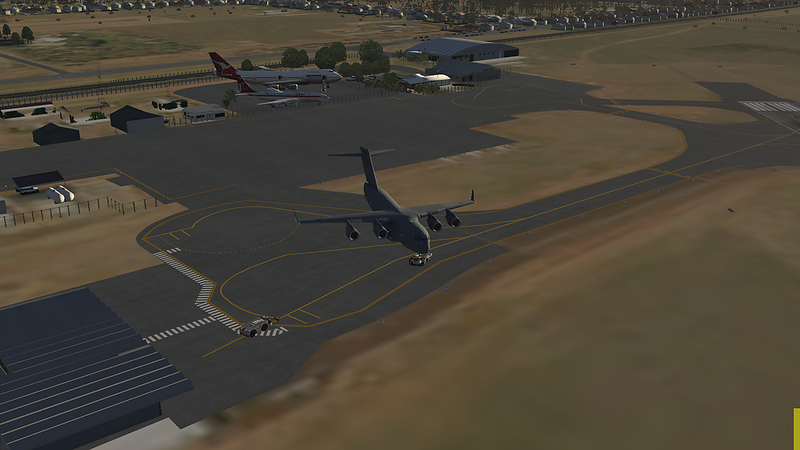 Here we are out front of the Longreach terminal with our ever trusty tug standing by waiting for us. Time to close up shop and move out. Unfortunately the Tug Driver had one too many pulls on Daddy's Moonshine last night and ended up driving us into the terminal! Repairs completed and the Tug Driver fired, we were properly moved out into position. And we were off into the darkening blue with the glowing sun melting into the sky behind us. Love the colours here. 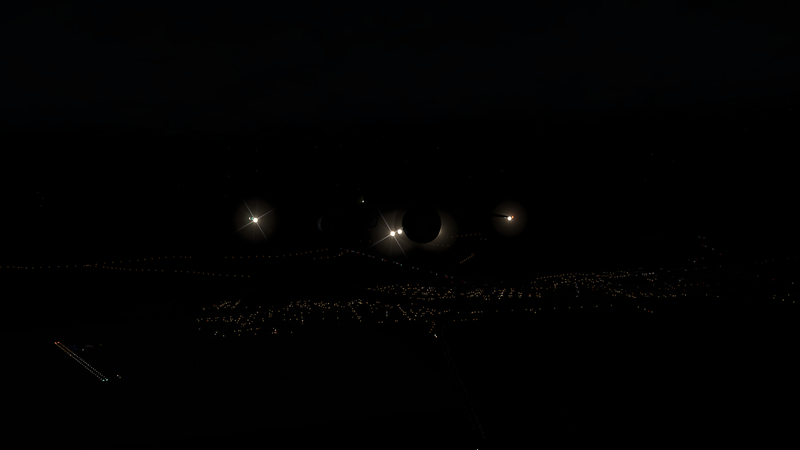 Pity the Landing Lights aren't fully lighting the fuselage as it takes away from the shot somewhat. 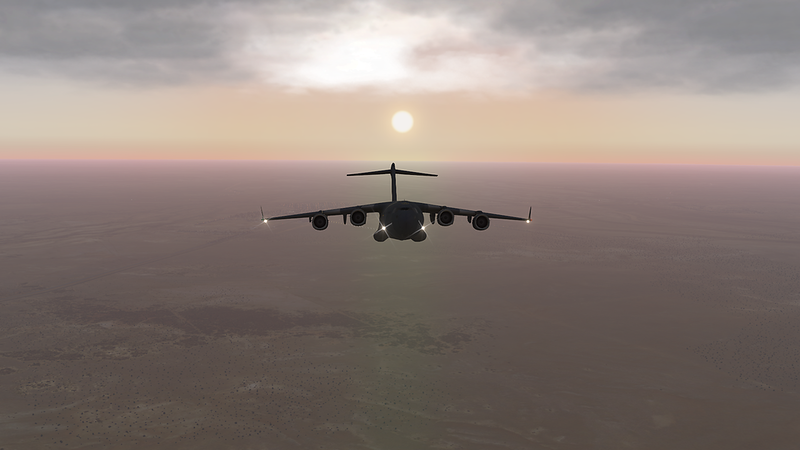 The quicker we moved away from Longreach, the quicker the sun sank behind us, painting incredible pastels in the sky. Starlight, star bright. First star I see tonight.... My daughter has just learned this rhyme and it took us two weeks over going out each night to spot the first star before she finally was able to make her wish... What'd she wish for? Since we're below 10,000 I've turned on the Taxi Lights as well as extra signal lights. 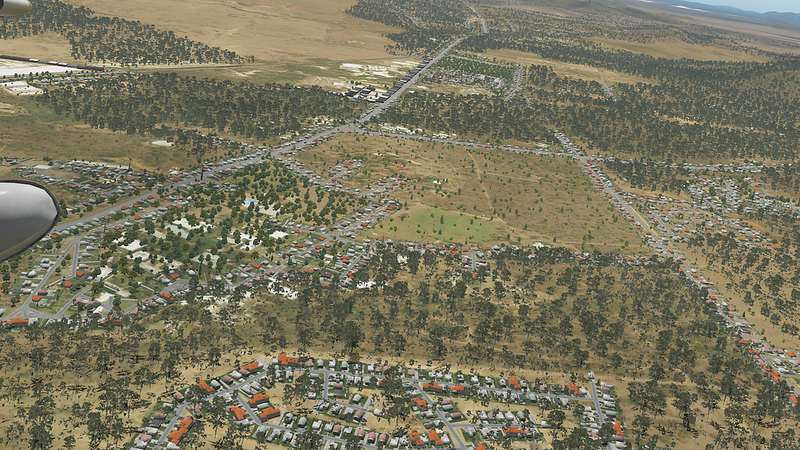 Barcaldine was too small to remember, but I did take this shot of Claremont as we turned at LUKPU for EML. 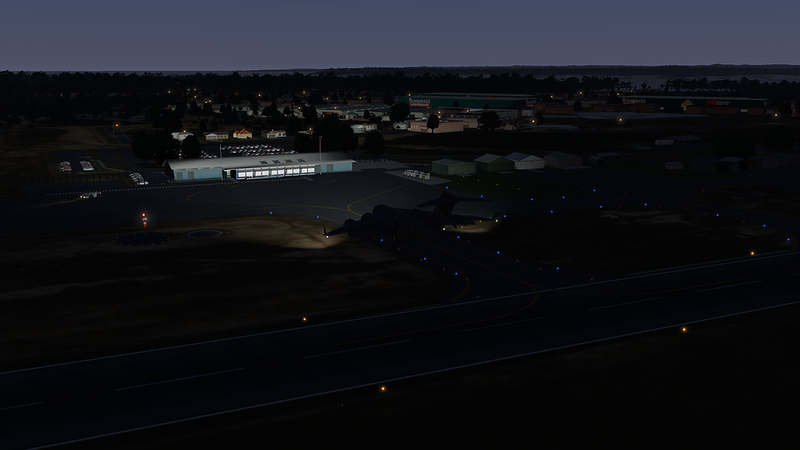 X-Plane does a wonderful job of lighting at night, but I don't think it knows the difference between city lighting and country lighting. 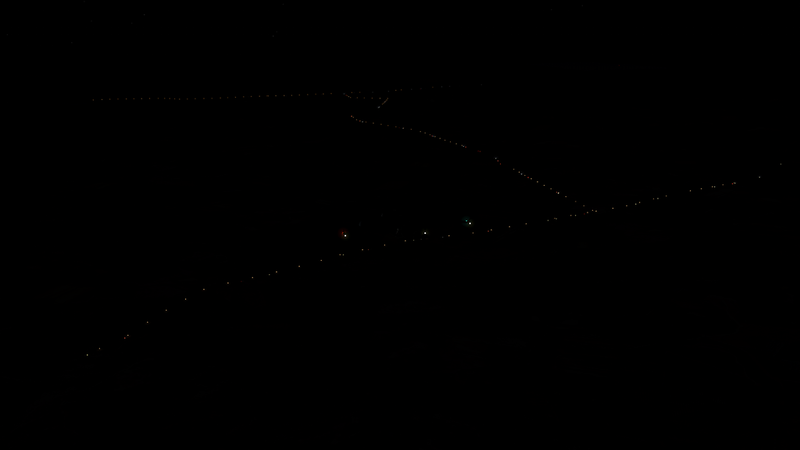 Guarantee that a) there's not that many street lights between Emerald and Claremont (lived in Emerald for a couple of years) and b) There's not THAT much traffic on the country roads. 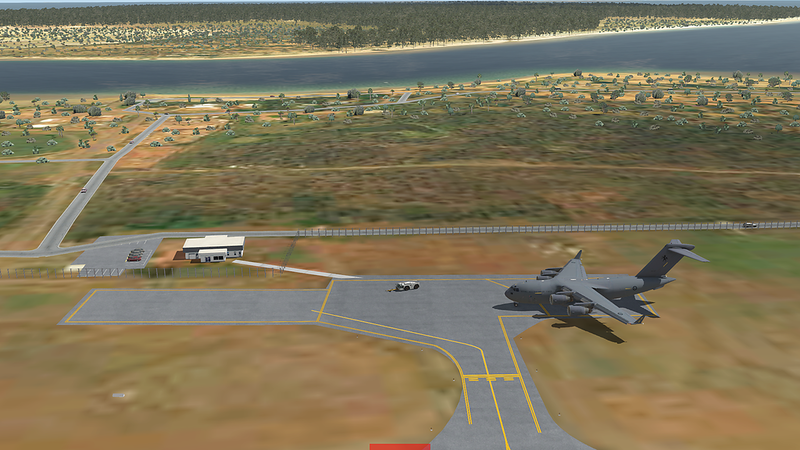 Leaving EML behind as we head on to MANDO and then our RNAV approach to Rwy 15. 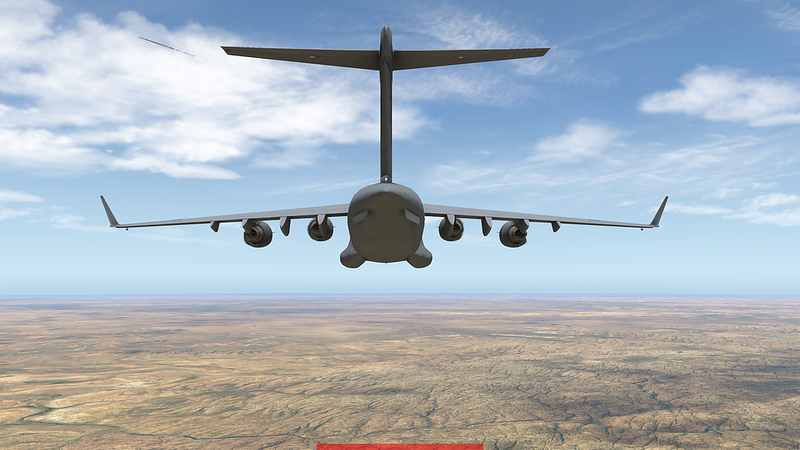 I actually did a bit of descent planning for this one and to I am at the designated height whilst turning on to final via BRKNI. 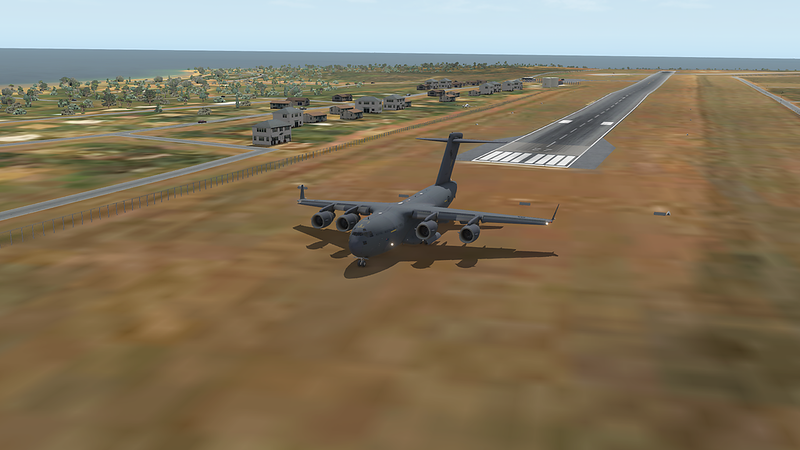 I was very happy with my landing, still lots of room for improvement, but that's what this is all about isn't it? 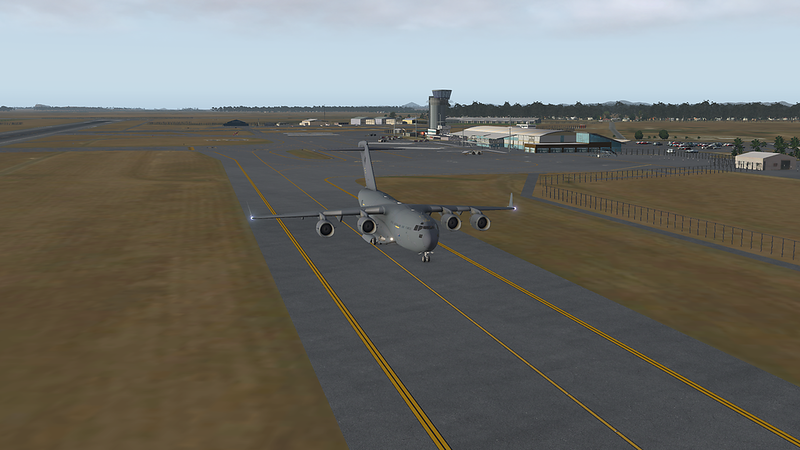 Anyway coming back on taxiway Juliet. Not REALLY where I'm meant to park. But certainly a more interesting shot. So what are we going to do in the "Beef Capital of Australia"? Well we could to a Steak House or go to the Rodeo Pub and ride the Mechanical Bull.. However, I'll go hire a car and drive town to Yeppoon, great little surf village down the road where I finished my High Schooling. Thanks for reading guys. See you again soon. As this is the last leg of the 2016 GAAR, this will probably be my last post to this thread. It's been an interesting journey and there are been many things learned and thrown out the window during it. 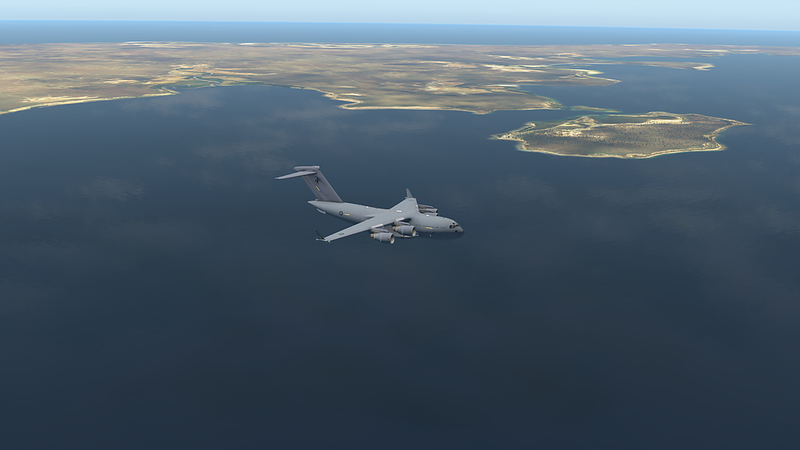 Before I get going though, I did say that I would head down to Yeppoon for a couple of days, well instead of hiring a car I found something in the back of the C-17 labelled: "From Q, with love." Huh. But it did fire up nicely and had great windows for my little trip to the sea. Yea it's not much, but that's my Alma Mater: Central Queensland University. 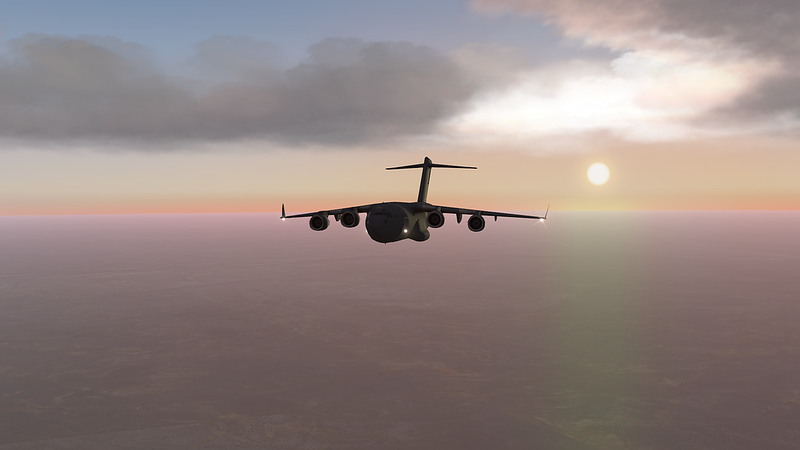 WOW the windows on this thing are amazing! 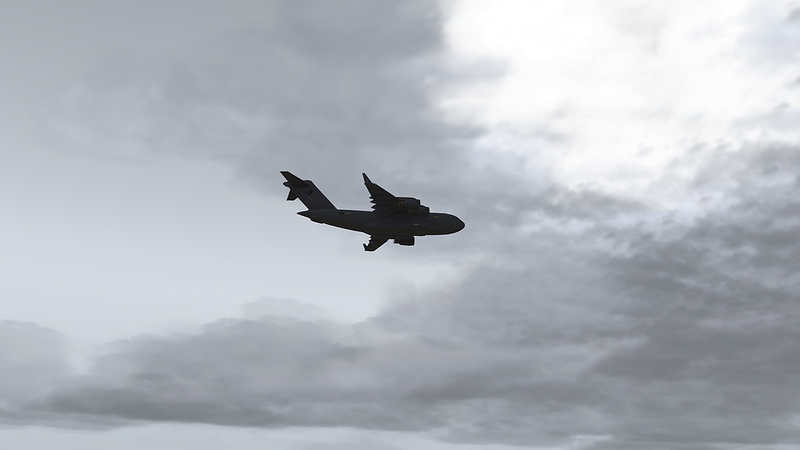 Will have to fly her a bit more. 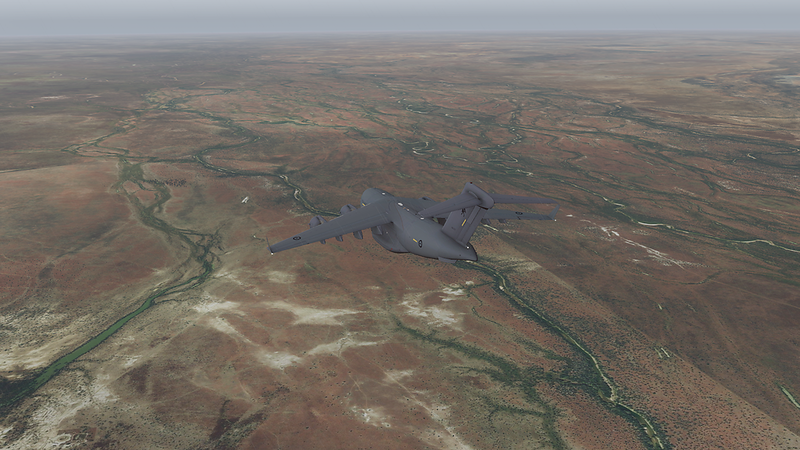 Might be a little hard to make out but I did manage to use some custom DEM (DSM actually) files with Ortho4XP. Found some 30m sources for Australia, the world actually. Just google ALOS World 3D 30m, create a free account and start downloading. These are upscaled from original 5m sources but not quite willing to shell out for the 5m sources. SURPRISE! Whilst it's not Bessy and technically Q did not give this to Bond it was the plane he flew to Scaramanga's island in Man With The Golden Gun. Lovely little plan to fly and going to have to read up more about her now as those windows are INCREDIBLE! 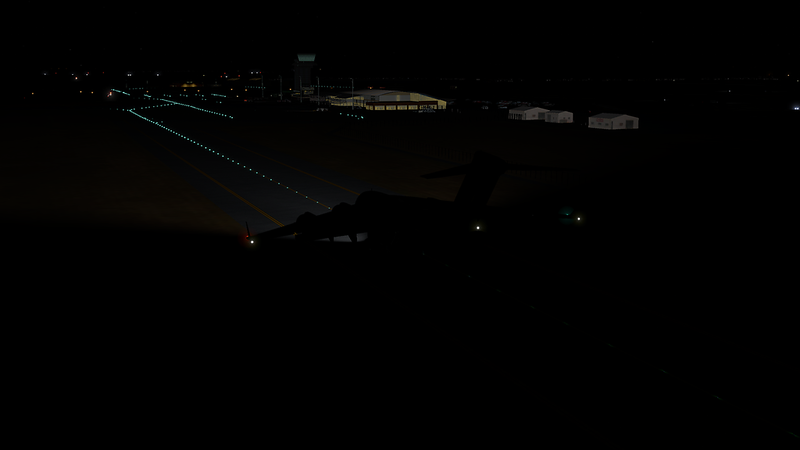 Lets get this final leg underway. 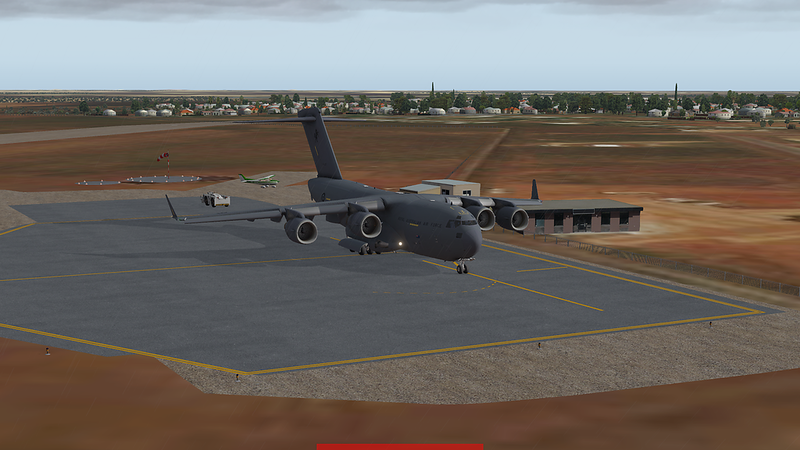 After several attempts I finally managed to get my flight plan loaded. 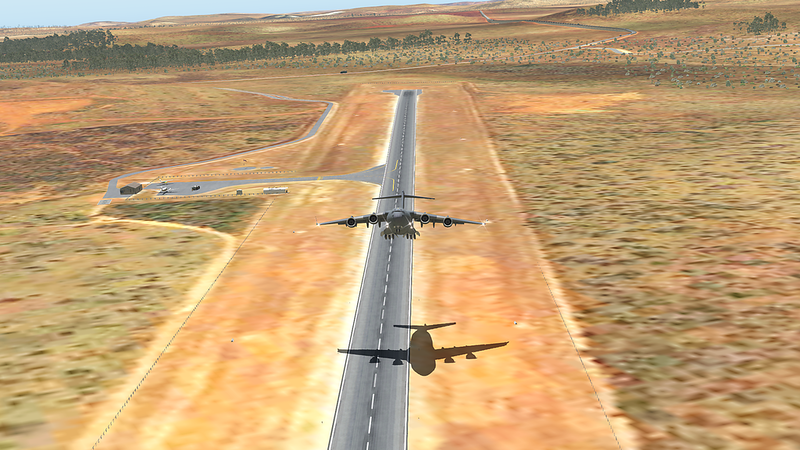 I was trying to be too tricky and foofed it the first time and had to redo the flight halfway through! 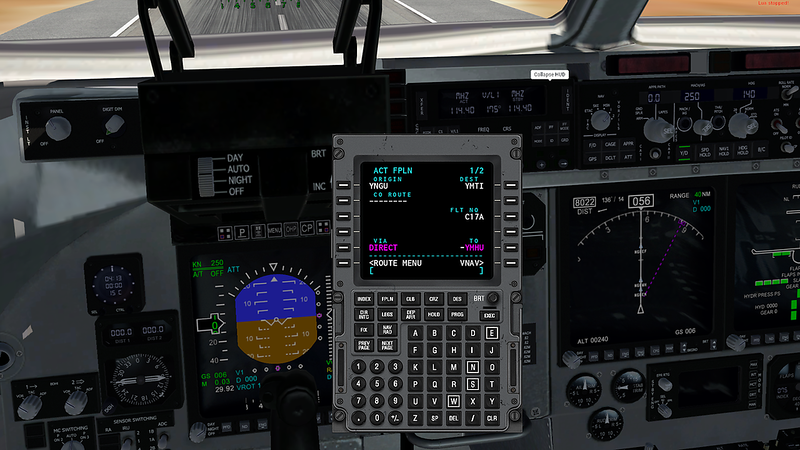 Going to attempt some VNAV and descent planning with this final course and am heading up to FL230 for 300Kn. Got the AP set for my first transition. 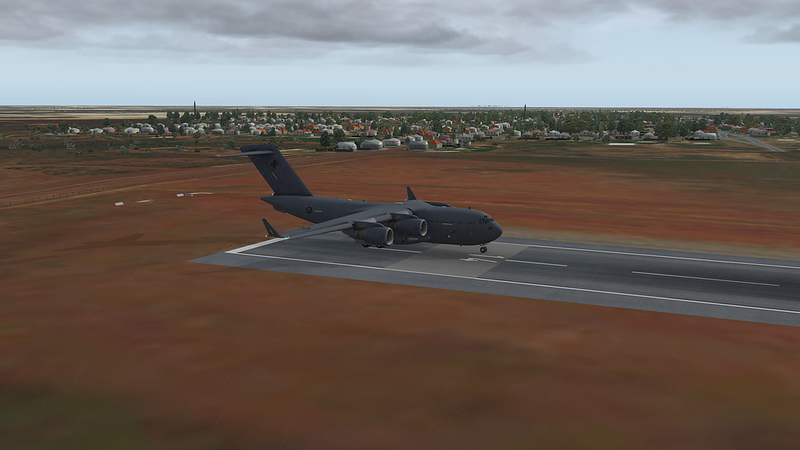 Taxing to the Rwy 33, I thought I'd do a flyby over the city rather than just head straight out. Top of the Hill there is what amounts to Rockhampton's Lovers Lane/Lookout. Quite a few nights heading up the "mountain" in the old Ford XF Falcon. 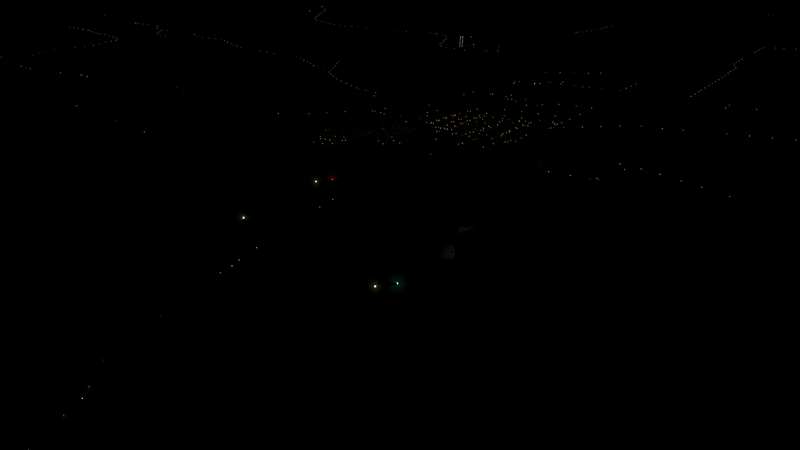 Does actually have a really great view of the city and its lights! Apart from me not completing my proper QA process on this map tile, it's quite amazing to see all of the electricity lines as well as the ships in the harbour. 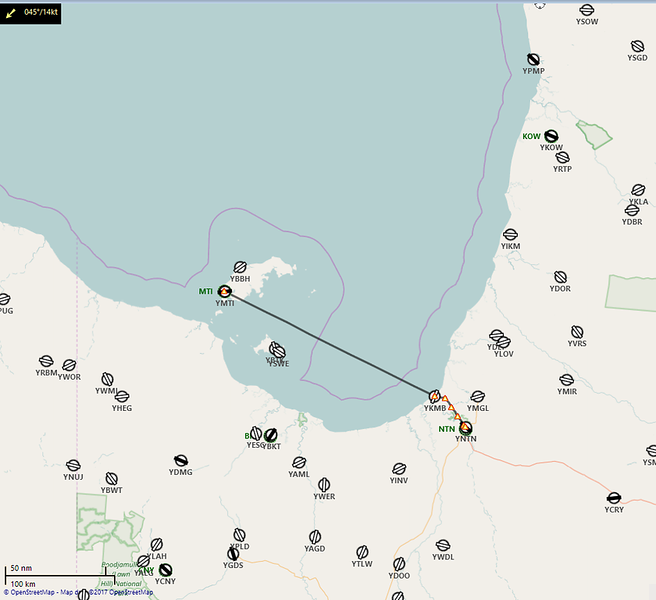 Gladstone (below) is one of Australia's busiest coal ports IIRC. Another pastel sunset. Almost to our cruise alt. Which, we no sooner reach and we have to descent. It's really hard to tell in the above pic but damn it was a hard lesson! But we did arrive. Oh look, a Bunnings. Know where I'm headed tomorrow! I attended a school camp here one time and promptly sliced my foot open on some oyster encrusted rock that was hidden in the tide... I miss living in Queensland! Thanks so much for reading my crazy caper. I've had a blast and learned a lot. 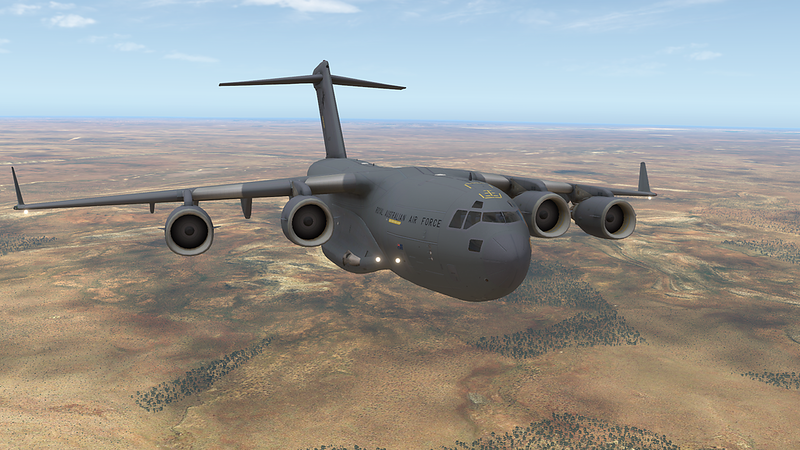 Well I did manage to pickup the C-17 for P3D so I'll check that out.